The Warney estate was bought by Herbert Hardy in the 1950s. 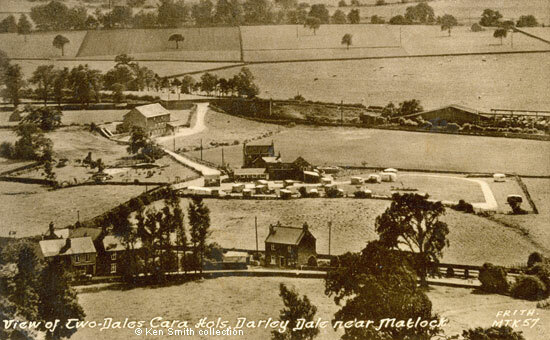 He transformed the land surrounding Warney House into a caravan park - "Cara Hols". This was to be his first enterprise on the site. 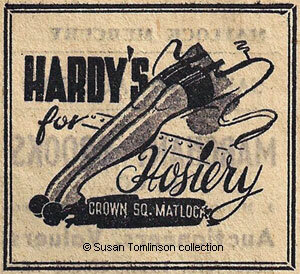 Mr. Hardy had at one time sold ladies stockings, initially from a suitcase and then from his hosiery shop on Bakewell Road in Matlock next to what was then the market and bus station. The top postcard shows that quite a few changes had taken place since the Walton family had owned the property (see the photographs on the previous page). For example, the climbing plant covering the front and side of Warney House had been removed and so had several large trees. 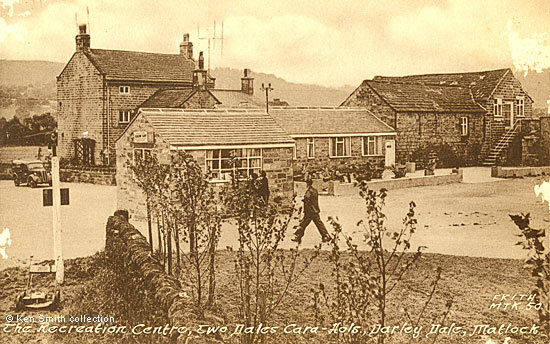 Some of the farm buildings, plus the greenhouse / vinery, had been demolished. Other buildings had been either added to or converted to provide facilities for the visitors, such as the Recreation Centre shown below. 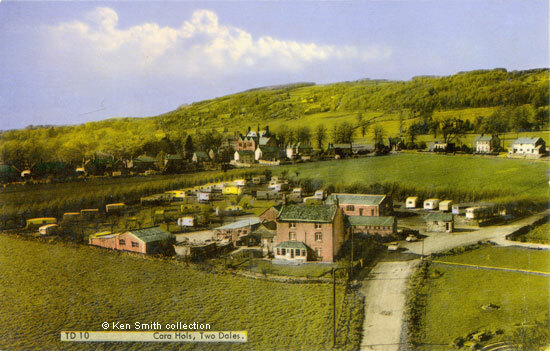 The third postcard in the series (below) looks across the Derwent valley towards Birchover and Stanton Lees. The embankment was part of the Manchester to London railway line and on the far side, close to the top of the picture, is the River Derwent which is marked by a line of trees. The building with the long low roofline next to the railway embankment was the Victoria Saw Mill. Warney Mill, a stone built corn mill, is also close to the railway line - further down the road, past Warney House and the caravan park. When the estate was sold in 1950 the mill, which was then used as a Flour and Feeding Stuffs Mill, had both a Mill Dam and a water wheel. Herbert Hardy eventually set up DFS (Direct Furnishing Supplies) on the site and pioneered Sunday trading as we know it today. When he started up DFS, the number and type of goods that could be bought on Sundays was very limited and did not include furniture. He thought of an ingenious way of getting round the law by allowing people to buy, say, a pound of carrots and then giving them a sofa or three piece suite as well. However, the price of the carrots bought on a Sunday matched the price of the furniture that was sold during the week. Advertisement from the Matlock Mercury, 7 Jul 1951. Three postcards of the Warney estate after it had been turned into Cara Hols. Newspaper adertisement © Susan Tomlinson collection. Marchant Brooks sale brochure, printed by Smith's Printing Works, Ltd, Bakewell Road, Matlock (with grateful thanks to Ken Smith for giving me a copy). The auction was held at Marchant Brooks' sale rooms on Causeway Lane.